Chevron Sri Lanka donates a vehicle engine to Sri Lanka German Training Institute in Kilinochchi | Welcome to Chevron Lubricant Lanka PLC. 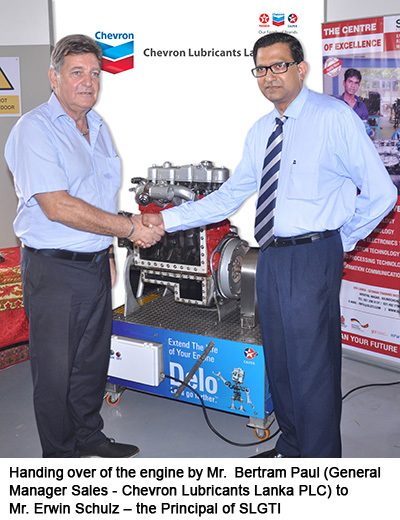 Chevron Lubricants Lanka PLC the leader in the lubricant market in Sri Lanka recently donated an Isuzu 4JBI diesel engine to the Sri Lanka German Training Institute (SLGTI) in Kilinochchi. The donated cutaway working engine can be used to show students the different parts of an engine and practically demonstrate how the engine operates including how the lubricant works in an engine. This donation is expected to enhance the quality of the learning imparted to the students of SLGTI who are pursuing demand-driven vocational education and training in selected trades. Chevron Lubricants Lanka PLC is listed on the Colombo Securities Exchange and is majority owned by the US Energy Company – Chevron Corporation. Incorporated in 1992, Chevron Sri Lanka is the leader in the lubricant market in Sri Lanka with the widest distribution network of all lubricant companies in the country. The company engages in blending, manufacturing, importing and marketing lubricants, oils, greases, brake fluids, and specialty products in Sri Lanka. The wide portfolio of Chevron products provides the finest lubrication technology solutions for industrial, commercial, and consumer applications. Chevron Lubricants Lanka PLC markets its products under Caltex, Havoline, Delo and Lanka brands. Chevron Sri Lanka also exports its products to the Maldives, Bangladesh, Pakistan and Thailand generating valuable foreign exchange income to Sri Lanka. As an esteemed technical educational and training institute; Sri Lanka German Training Institute (SLGTI) in Kilinochchi is committed to educate, prepare and inspire young adults to meet the needs of the 21st century. SLGTI is known for providing practice-oriented vocational training programmes at NVQ Level 4,5 and 6, which contribute to a unique learning experience. Promoting a demand oriented international education for technical professionals in the private sector, SLGTI is actively supporting the reconciliation process in Sri Lanka. The establishment and implementation of SLGTI is supported by the Deutsche Gesellschaft für Internationale Zusammenarbeit (GIZ) GmbH and the Kreditanstalt für Wiederaufbau (German development bank – KfW) on behalf of the German Federal Ministry for Economic Cooperation and Development (BMZ) and is operating under the National Apprentice and Industrial Training Authority (NAITA). SLGTI in Kilinochchi offers 4 programs in 6 different vocational fields. The delivery of training is based on German vocational training standards and covers the fields of Automotive Technology, Construction Technology, Electronics & Electrical Technology, Food Processing Technology, Information & Communication Technology, and Mechanical Technology. The technical training programs at SLGTI are designed on a modularized basis with flexibility in meeting emerging needs. The collaboration with Chevron will strongly support SLGTI to prepare its students for the demands of the local labor market. Chevron will conduct a ‘train the trainer program’ to train the instructors of SLGTI and equip them with the latest knowledge required to deliver programs on lubrication. Chevron personnel will also conduct training for automobile & mechanical engineering students on the subject of lubrication. Chevron Sri Lanka also intends facilitating on the job training opportunities for SLGTI students with Chevron channel partners such as Caltex Star Care service stations. Chevron Sri Lanka has been at the forefront in uplifting industry standards through empowering and developing the skills of the future workforce through training programs. The company has been actively involved in conducting technical training on lubrication for the students of Ceylon German Technical Training Institute in Colombo, the Don Bosco Training Centre in Negombo, The Sri Lanka Navy – Thakshila Training Centre in Welisara, Sri Lanka Navy Artificer Training and industrial visits for students of HNDE in Kandy and NDT Marine in Moratuwa. Further the company has conducted numerous knowledge sharing sessions on Lubricant Technology for engineering biased government institutions such as the Sri Lanka Transport Board (SLTB) Sri Lanka Railways (SLR), Ceylon Electricity Board (CEB) and the Sri Lanka Ports Authority (SLPA) as well as lubricant retailing outlets and vehicle service stations island wide. Chevron as a socially responsible organization is a major contributor to the nation’s growth, aligned to its global vision ‘To be the global energy company most admired for its people, partnerships and performance’.